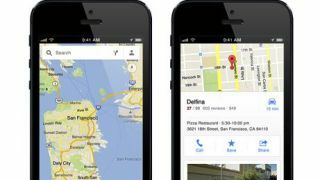 Google Maps for iOS received its first update today since the app launched late last year. The update's biggest feature is that users can now sign into their Google account through the app to access their Google Contacts information. The addresses for friends, family and acquaintances will automatically be added to the map data, letting users search for their contacts by name directly through Google Maps. Users can also more easily search for nearby locations by using preset categories like restaurants, gas stations and movie theaters. The categories give the same result as simply typing "restaurants" into the search bar, but are slightly quicker since users just have to tap an icon and not spell out the word. The app also now lets users manually set the map to measure in kilometers or miles, regardless of the local measurement system. The ability for Google to independently update its app was one of the silver linings when Apple dropped Google Maps as its default navigation tool, so it's good to see Google actually putting updates to use. However, the iOS app is still a ways behind Google's Android version. Features like offline maps, biking directions, and indoor floorplan maps are still missing from the iOS app, with no word from Google on plans to bring them over. Still, any update is better than no update. Google Maps users on iOS can download the free update now from the Apple App Store.